YOUR COMFORT IS OUR GOAL! Se habla Español. for Commercial, Residential & Industrial. We are experienced ductwork designer & installer, offering high quality ductwork installation, ductwork fabrication and custom ductwork products for many residential, commercial and industrial air conditioning systems. 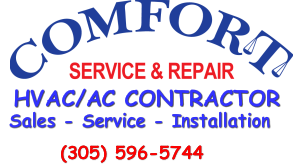 We are well known in the South Florida and Neighboring areas for quality HVAC services, including manufacturing, procurement and installation of duct work. Our ductwork solutions are practical, cost effective, and oriented to the optimal performance of your heating/cooling equipment. RENOVATIONS & OLDER BUILDINGS FOR OVER 30 YEARS! Protect your home and family, Breathe free! Experience our worry-free air duct cleaning services! Clean air ducts are critical to the health of your family and your home or business. Comfort Service and Repair, specializes in vent and air duct cleaning & sanitation. like promptness, efficiency, competitive pricing, and client-focused service. STOP! Suffering from: Excess Dust Allergies & Energy Waste! Dryer vent- Stop wasting Energy! Clogged dryer vents are dangerous!